Recently I had a close family member who was targeted by a hacker, trying his luck with a ransomware threat for $3 000. It was one of those things that happens to someone else, until, of course it happens to you. Thankfully I have always been militant about having backups of data secured away, an approach I passed onto the target of the attempt. Thanks to this the threat was minimized with none of his data being lost. It does though, bring to the fore the fact that data is now in the firing line, and having a backup or two is no longer a luxury. Around the same time LaCie offered me a chance to review one of its rugged portable hard drives, which I jumped at. 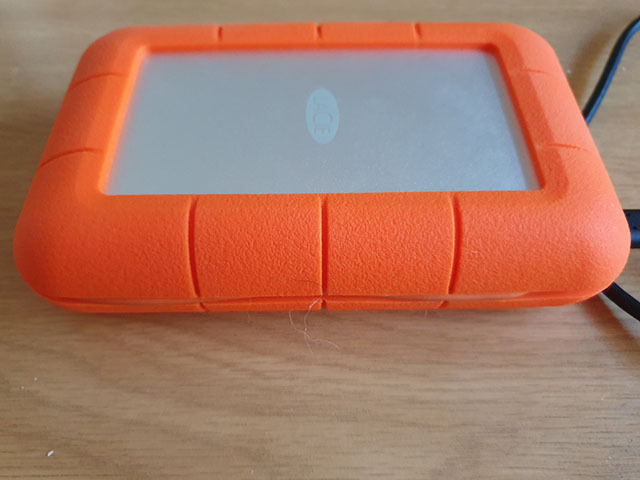 Indeed, on unboxing the drive, it’s clear how much attention has been paid to making this portable drive, and the data it contains, as invulnerable to physical damage as possible. Encased in a thick layer of a foam-like protection, it’s not difficult to imagine the LaCie surviving a fall from a good height or even often rough handling of security personnel at the airport. That’s a really good thing too, since this is a whopping 5 TB capacity – which is loads of data. That means it also serves not just as a way to backup critical data, but also keep a copy of your notebook and PC hard drives, as well as the files and media contained on your tablets and smartphones, and have ready access to all of them from the convenience of one drive. Besides from being protected to the hilt, how well does the LaCie handle the transfer of large volumes of data? Very well, in fact. When transferring from PC to the drive and vice versa, via USB 3, I saw transfer speeds of 30-60 MB/s on average, with an 11 GB folder being transferred in about three minutes. On one occasion the drive offered higher speeds - as much as 100 MB/s, when transferring an even larger folder of media, which saw 75 GB being copied across in 15 minutes. Finally, when I plugged a second USB 3.0 external hard drive into the notebook, and transferred from the LaCie into it, and vice versa, the speeds weren’t hugely different, on average between 30 and 50 MB/s. In that instance,10 GB took three minutes and 30 seconds both ways. This means that the drive could be ideal on location for photographers and videographers who are shooting high volumes of data and want a backup - or extra storage - for RAW and 4K video files, and don’t have too much time on their hands to wait for their transfers to finish. Even though the drive isn’t exorbitantly expensive, it does cost a bit - around R3 800. You may ask, why not just opt for an external desktop hard drive which can do the same for half the price? Well, because the latter relies on electricity, which, if you currently live in South Africa, you may be aware has become frustratingly unreliable. Without it, you don’t have access to your backed up data until power is restored, which can be a problem when you are trying to bravely soldier on through a blackout and need to access a file from months or years ago that has been archived. 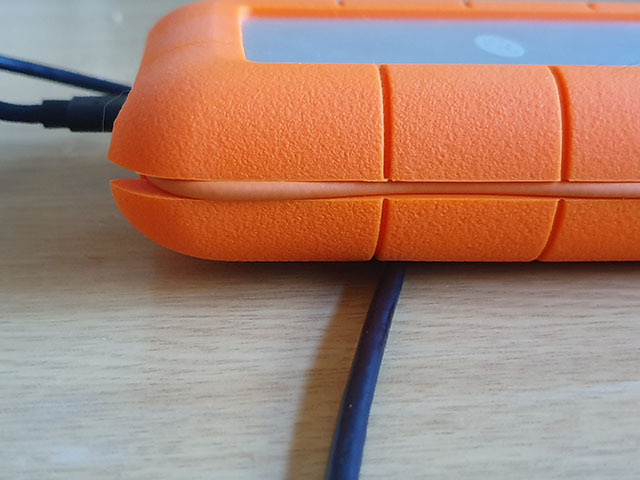 This a problem that the LaCie Rugged hard drive does not share. Even if you are willing to chew through your data searching for the file on Google Drive or Dropbox, a more elegant approach is just to archive all docs on a device like the LaCie 5 TB, plug it into your laptop and search away. It’s for the above reasons that I think the drive is not just ideal for general users, but a potential boon for small businesses as well. The capacity, durability, security of having offline backups and ease of access can make it a lifesaver in the event of a hacking attempt. It’s also small enough, and capacious enough, to backup critical files offline every day or so and take home with one. That being said, it is not a replacement for backing up to the cloud, since it is just as vulnerable to being stolen as your notebook, but rather an additional way to store data. Admittedly, in a cloud era, the argument could be made that people should just upload their files to the cloud, whether Google, iCloud, dropbox or another service, and certainly, cloud uploads have merit. However, if you are shooting large media files, on location, for example you don’t necessarily want to use up all your data uploading your latest footage, and that really where the LaCie external drive is not just the most logical solution, but also the best one. It is currently available online from Loot, Outdoorphoto.co.za and Takealot for around R3 700.